This was first made for a family member who had a scalp so itchy they went to bed with olive oil and cling wrap around their head. It took 6 months of trialling until we banished the cling wrap to the kitchen for good. Our Scalp Friendly Milk Shampoo has now become one of our most popular products. Read our 'We got mail" page to see how much it has helped people with scalp problems. We use natural ingredients combined with ingredients to control the micro-flora of the scalp that can cause scalp problems for many adults and children. pH balanced. Natural Cleansers. Bottle size is 500ml. We are proud to show all ingredients on our website for your research, not only the prettiest ones. Ingredients: Aqua (H2O’s Fancy Name), Cocamidopropyl Betaine (Coconut-Derived Cleanser), Decyl Glucoside (Glucose-Derived Cleanser), Lauryl Glucoside (Glucose-Derived Cleanser), Glycol Distearate (Emollient), Sodium Cocoyl Sarcosinate (Coconut-Derived Cleanser), Coco Glucoside (Glucose-Derived Cleanser), Glyceryl Oleate (Natural Ester), Piroctone Olamine (Olamine Salt), Fragrance - Oatmeal (Phthalate-Free), Allantoin (Comfrey Root Extract), Hydrolysed Milk Protein (For Hair Repair). Prior to using your Milk Shampoo and Cream Conditioner, I had been using another brand of shampoo and conditioner to control psoriasis of the scalp. Whilst the products I had been using had some beneficial results, the inflammation and flakey scalp remained. I put up with this situation for three years! About six weeks ago, I noticed a display of some of your hair care products at my local pharmacy and decided to trial the shampoo and conditioner as the "no chemical" nature of them appealed to me. Within , the psoriasis was gone, yes, GONE. I haven't enjoyed a non-itchy scalp in so long, it is hard to believe that the condition has cleared up. Nevertheless, I continue to use your shampoo and conditioner. I have also had similar results with your Eczema and Psoriasis Balm for outbreaks of psoriasis on my forearms and lower legs - fantastic results. YOU GUYS ARE ON MY CHRISTMAS CARD LIST!!!! I wish you and your colleagues every success in the future - you have a salesman in me, I will not hesitate to recommend your products to my family and friends. P.S. I love the branding and the packaging of your products – great graphics and information content. We don't claim that our products treat scalp irritation, only that they can help to lift and remove irritants; which with healthy scalp hygene, is much easier for the scalp to recover from the stressors. I have been a big fan of your body products for a while and LOVE the soaps, milky wash and udder cream to bits. After watching your shampoo ad I decided to give it a whirl as well. I was SHOCKED. It is incredible. My hair is glossier, softer and more manageable now than it EVER HAS BEEN. Amazing given it is dead. I didn’t know that till I watched your ad. Sorry for the capitals but I am SERIOUSLY EXCITED by this. Gone are the days when I spend $50 on a bottle of shampoo or conditioner. My husband is delighted too. But my excitement doesn’t end there. You popped a little sample of your anti-ageing moisturiser in my order. Whilst I have always been a big fan of your body products I have never used the milky wash on my face and use a very expensive brand of face wash and moisturiser to "re plump" my skin - or some such thing. Well - I thought – I have a sample, it would be rude not to use it. So I did. OMG. I used the milky wash on my face then the moisturiser. I AM IN LOVE. My skin looks AMAZING and I am in awe of the power of your NATURAL PRODUCTS. Thank you, thank you, thank you. Am now a certified moo goo addict from head to toe. Amazing is all that can be said. I have had dry skin and scalp issues all my life. After decades of trying everything else on offer, I was directed towards your products. All my skin problems have disappeared. I can’t tell you how amazing it is to find something that works after decades of broken promises. Thankyou, thankyou, thankyou! Your products are truly all that you and your fans proclaim and more! I have been blessed with lovely skin but it has cost me a fortune to keep it this way, having now graduated to expensive products for mature age skin. After reading your ad in a Reader's Digest I visited your delightful website, liked what I read and decided to order some products. Since using the anti-aging face cream, apart from how good it feels, what has amazed me the most is that the brown age spots which were beginning to emerge on my face and neck totally faded over a few weeks... a bonus I never expected. I am applying it to my hands and arms twice daily and the spots are gradually fading. My husband has contended with dry itchy scalp for most of his adult life having tried virtually every lotion and shampoo on the market with great frustration. Since using the Moogoo products his scalp has cleared up completely. Needless to say we are both totally converted to your products which I have now sourced at a nearby pharmacy, tho I was very impressed with the prompt service and the free sample from my first order online. We are encouraging our family and friends to change over to your natural products. Thank you Moogoo team. May your business continue to flourish for all the right reasons! For over 10 years my husband Terry has suffered from psoriasis on the scalp, which was both embarrassing and very itchy. We have spent many dollars on many different chemicals which was against my belief and I hated using these on Terry's poor scalp. None of these chemicals did much to alleviate the problem. We received our first order a few days ago of Eczema and Psoriasis Balm which Terry used immediately and the difference is unbelievable. No itching, redness or unsightly 'snow storm' on his collar. He is also using the Milk Shampoo and his hair feels wonderful. I decided to try the shampoo this morning and my scalp felt soothed and my hair, healthy. Thank you for a very well researched product and for explaining the difference between "active ingredients" and "excipient ingredients". 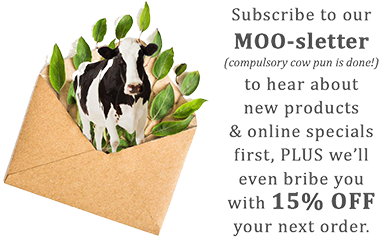 We are happy at MooGoo being Proudly Australian and is made using natural ingredients. Thank you also for the sample of moisturising cream which was gratefully received. We are coming to Queensland for 2 weeks within the next few days so maybe we will be able to visit you and load up with more unbelievable but true products.